Introducing Funny Furniture, a collection of cartoon-inspired kids playroom furniture designed to look like they've been pulled right out of the television! Adorned with hand-drawn plaids, floral patterns, zigs and zags, you've never seen children's furniture quite like this. 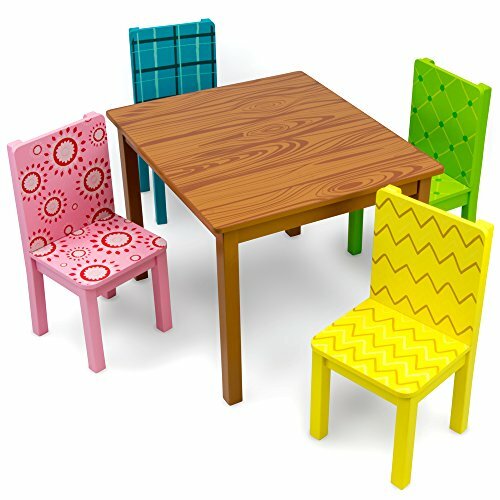 In this set, we've included a brown wood grain kids table and four colorful play chairs. Each set is made of natural wood and finished with water-based safe paints. Assembly is simple and all hardware, fasteners, tools, and instructions are included. Easy peasy! With Funny Furniture we endeavored to design the kind of play furniture that inspires children to create! We think this is the perfect arts & crafts activity table, but is also great for board games, imaginative play with action figures and wood figurines, and is even great for reading and coloring. The 26" x 22" rectangular kids table stands 19" tall, about half the size of standard adult tables, and is the perfect size for growing toddler boys and girls. It's a great addition to bedrooms, playrooms, even living rooms--wherever you want your child's creativity to flourish!